ST. THOMAS, V.I.—The questions, both halachic and practical, start early on this 32-square-mile island in the Caribbean Sea. 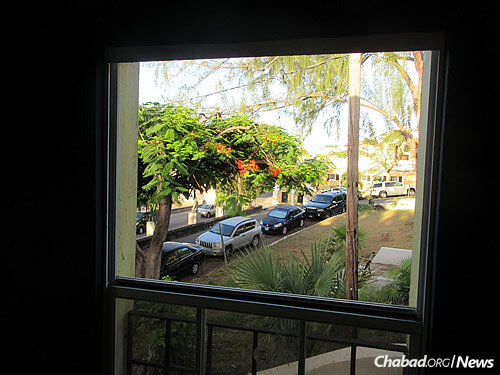 Rabbi Asher Federman, director of Chabad Lubavitch of the Virgin Islands in St. Thomas, begins his daily routine of mustering up men well before the start of morning minyan at 7:30 a.m.
At 6:45, I am the first to be picked up at Sapphire Bay West Condos at Crystal Cove. Four of the rabbi’s sons are having a great time in the back of a black minivan. We pass through the Red Hook section of town on the east side of St. Thomas (named for the red-roofed homes and businesses along a rolling coastline), where boats depart for the nearby island of St. John. We stop for a New Jersey father and son outside their timeshare at the Ritz-Carlton. They are here during a vacation break from yeshivah and bring our minyan count to four. Neil Sosland from Kansas City, Mo.—an elderly gentleman Rabbi Federman refers to as “Reb Neil,” a longtime seasonal resident—is waiting in front of his condo, tallis and tefillin in hand. He has been coming to St. Thomas since 1985. We’re up to five. The conversation on the 30-minute hilly ride downtown is pleasant and educational. The New Jersey man asks if a shuttle that goes around the mountainous, windy island picking up people for davening would theoretically be possible on Shabbat. His 14-year-old son asks: “When can we pick up our challah for Shabbat?” The rabbi’s boys proudly tell of the time they walked seven miles on Rosh Hashanah from their home in the East End to the capital of Charlotte Amalie to blow shofar for various Jews along the way. “Remember, ‘Mr. P’ didn’t want to hear shofar at first?” one boy says. The rabbi good-naturedly corroborates the story. Just another day in the life of Chabad-Lubavitch emissaries serving the Jewish people. During my two weekday mornings in St. Thomas, Federman had complete faith that there would be a minyan. Little by little, an eclectic group of good-natured men finds their way up the steps to Chabad. A man in the jewelry business from Uruguay, who spent time in Miami before settling in St. Thomas 27 years ago, is number seven. The rabbi personally greets, hugs and thanks each person. His boys have their jobs as well: leading the first part of morning prayers, serving as gabbais during the Torah reading and depositing tzedakah in the free-standing charity box, about 4 feet tall. Federman is the master of the niggun. Some days, he simply needs to sing a little longer—to allow for the 10th man to find his way. And sure enough, reliable men eventually wander in: Moshe and Yaniv, two young Israelis in the cosmetics business; Ernesto, a photographer from Brazil who arrived in St. Thomas via a long stint in Hawaii; an Israeli 20-something from Tzfat who studied at a yeshivah in Brooklyn, N.Y., and operates a business here; and various others. The rabbi takes pride in the fact that “the locals are all new tefillin,” explaining that most minyan attendees did not grow up observant and are new to wearing tefillin, having purchased them within the last eight years. When minyan is over, Federman turns off the lights, gates the windows, locks the door, and everyone files down the steps back to the van for the return ride back. “I need to get the kinderlach to cheder,” he says, meaning back home, where they will study as part of an online school program for the children of Chabad emissaries around the world. And, of course, tourists will get busy as well, with days of tennis, swimming and snorkeling ahead; St. Thomas is world-famous for its beautiful beaches and sea life. Like the other islands in the U.S. 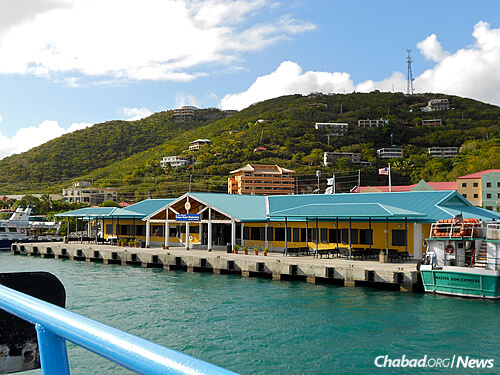 Territories (St. John and St. Croix), and the British Virgin Islands to the north and east, St. Thomas has a rich history, Jewish and otherwise. Christopher Columbus passed by St. Thomas, St. John and Tortola on his second voyage westward. These islands remained untouched by Europeans for nearly 150 years until certain countries placed their flags here—Denmark in St. Thomas, France on St. Croix and England in Tortola. The Danish later claimed St. John, bought St. Croix and built the Danish West Indies into a thriving sugarcane business and trading area. Jews first settled in the Virgin Islands in 1655, when it was ruled by Denmark, mainly serving as traders in sugarcane, rum and molasses. They purchased a cemetery in 1750 and founded the first congregation in 1796. The synagogue was built in 1803 and burned down a year later. 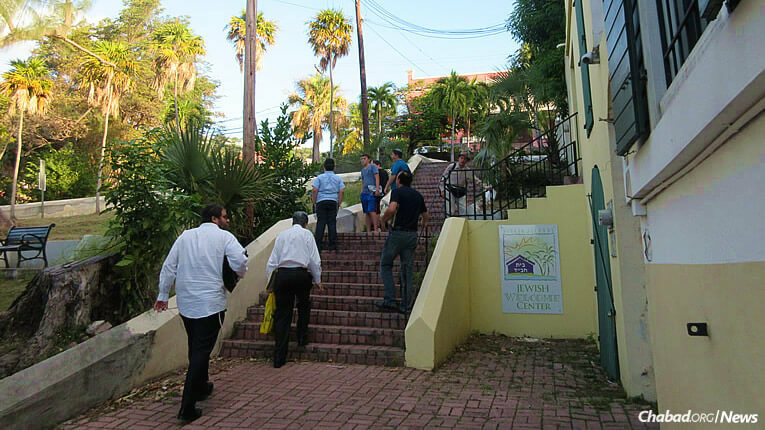 Following a long history that included additional fires and rebuilding, the present structure—on Synagogue Hill in downtown Charlotte Amalie—was dedicated in 1833. In 1917, the United States purchased the Danish West Indies. Residents of the Virgin Islands are American citizens, with the U.S. dollar its official currency. 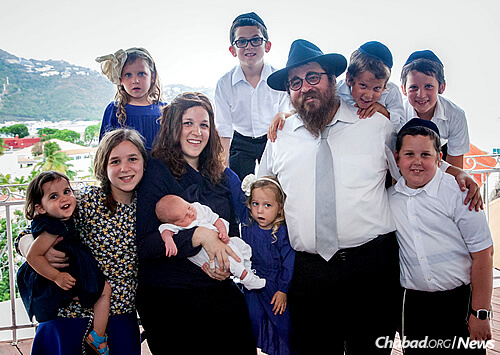 What’s the backstory behind Rabbi Asher and Henya Federman’s arrival in St. Thomas in 2005? After their wedding in June 2003, they Googled “Jewish communities with no Chabad Houses” and several popped up. They considered such countries as Luxembourg, Vietnam, even Bahrain and Cuba. “We weren’t looking for comfort,” states Federman. 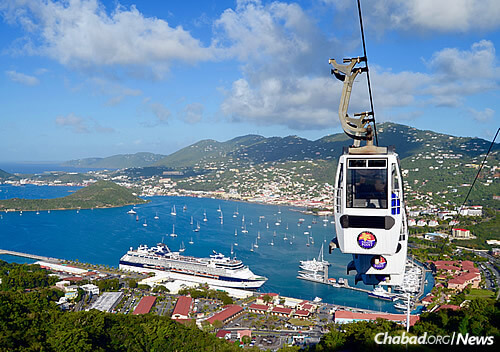 “We were looking for a place no one wanted to go.” Then, Rabbi Moshe Kotlarsky, vice chairman of Merkos L’Inyonei Chinuch—the educational arm of the Chabad-Lubavitch movement—suggested the Virgin Islands. “When we got here,” relates Federman, “it was a tiny rock in the middle of the ocean. We didn’t know the extent of Jewish life. We were told that there was a small Jewish community and a few tourists. And we were ready to do it. 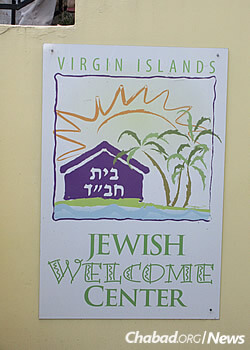 As it turns out, there were more Jews than we expected with deep-rooted connections to the island—timeshare-holders, vacationers, businesspeople and more.” He estimates between 400 and 500 full-time Jewish residents in St. Thomas, not to mention tourists year-round. Federman is constantly strengthened by the Rebbe’s “uncompromising and unrelenting call to reach out to every Jew, wherever they may be.” Even, and maybe especially, on islands in the middle of the sea. In their manifold efforts to encourage Jewish life and practice, in addition to all the programming and activities, Henya prepares kosher meals that can be ordered online and delivered to all parts of the island. 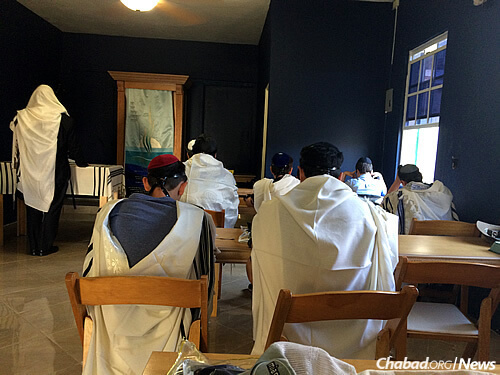 The rabbi teaches classes for short- or long-term periods, depending on a person’s stay. He himself learns regularly with Rabbi Michael Harvey of the historic St. Thomas Synagogue. Time in the Federman home, with nine children, is a one-of-a-kind experience. 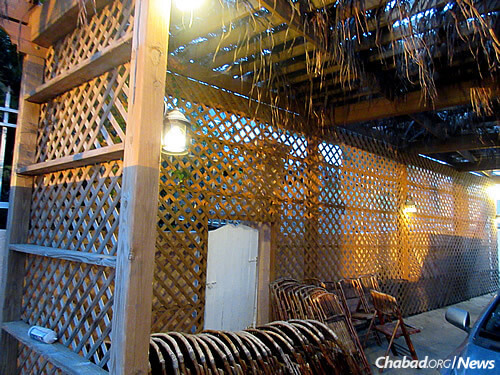 On a typical Friday night, tourists and locals pray inside then proceed outside to the driveway for Shabbat dinner. There are not many Chabad Houses in places where the weather is a consistent 85 degrees, complete with spectacular views of harbored leisure boats. On Shabbat morning, guests are greeted with refreshing cold water after their long walk to Chabad in the hot sun. Timeshare owners—from New York, New Jersey and Los Angeles—join local residents, the Federmans and two Argentinian female volunteers from Chabad. On my trip, everyone excitedly greeted a 14-year-old tourist who arrived alone, number nine in the minyan. So the rabbi began those niggunim as we awaited the arrival of number 10: John, a jeweler from Paris who lives nearby with his wife. 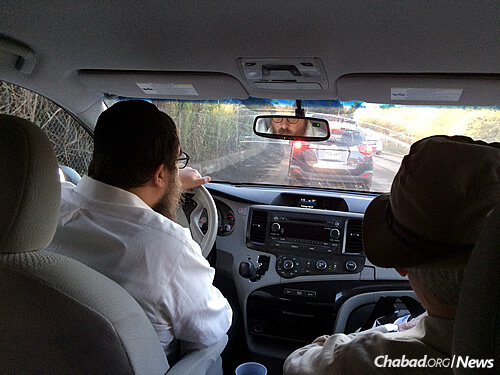 After our prayers, Federman went right to Minchah—just to be sure we davened with a minyan. After a delicious lunch of deli subs, schnitzel, Israel salads, kugel, cholent and more, in between words of Torah, the guests walked out the way they arrived.